I haven't seen these before this summer. 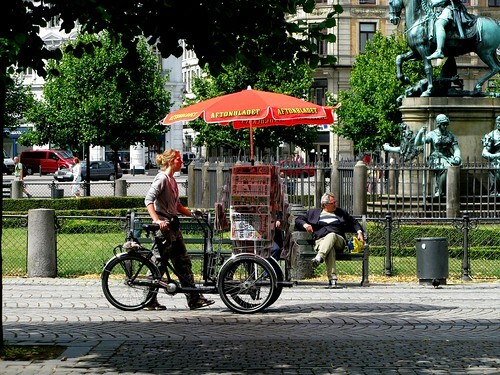 Bicycles selling newspapers to tourists. By and large it's foreign papers and both photos were taken near Nyhavn [New Harbour], which is the picture postcardy Copenhagen area. For some strange reason the parasol in the first photo is from a Swedish paper and the one on the bottom is from a Norwegian paper. A fine little Scandinavian collaboration. 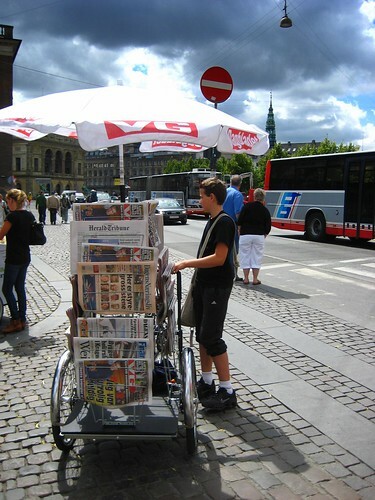 The papers were firmly in place on the racks so it looks as though once the parasol is down, it's easy to ride.